Earlier posts with other images of torii gates can be seen here. As I prepared some recent blog posts, I found some photos taken a little over a year ago when Brenda, Marilyn, Cheryl and I flew to Las Vegas, NV to celebrate Marilyn's birthday. 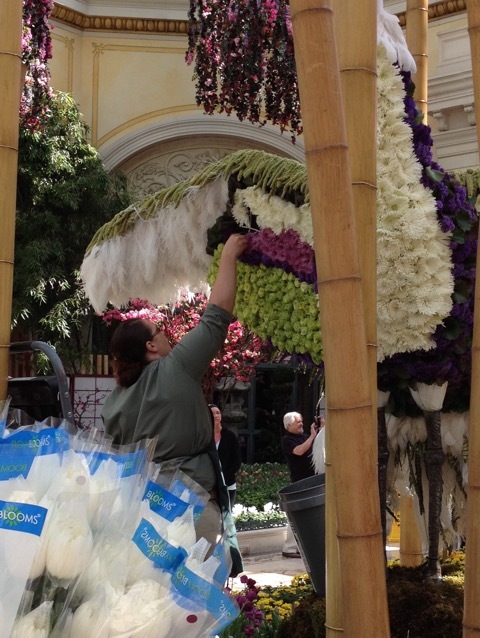 Today, I want to share a bit of springtime, Vegas style. 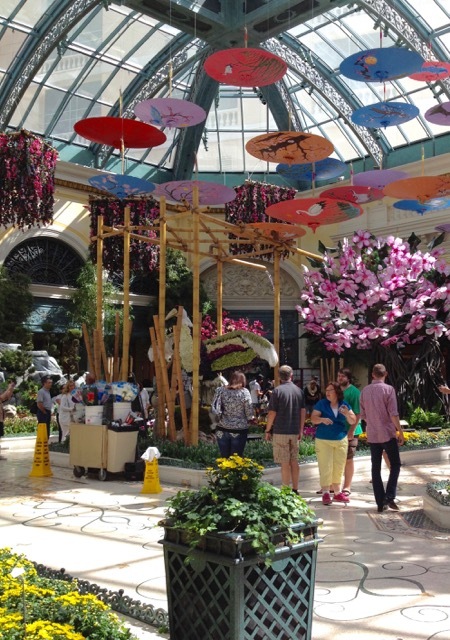 The morning we walked over to the Bellagio to have breakfast, was the day the floral displays were being refreshed - new, cut flowers were being placed into the large featured displays. This worker is replaced some mums on the large crane's wings. 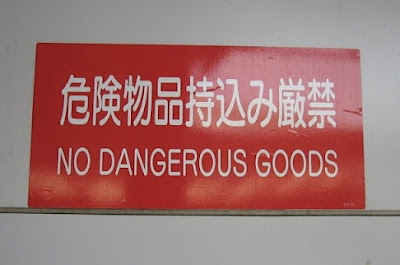 According to the sign near the crane, it was 6 foot high with a wing span of 6 foot. 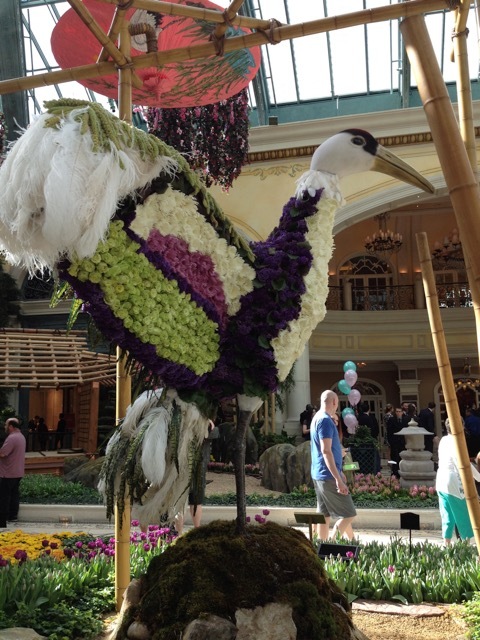 It was constructed of 200 feathers and 1,400 flowers. The legs were sculpted epoxy coating over steel armature. The cranes eyes were fabricated from acrylic. 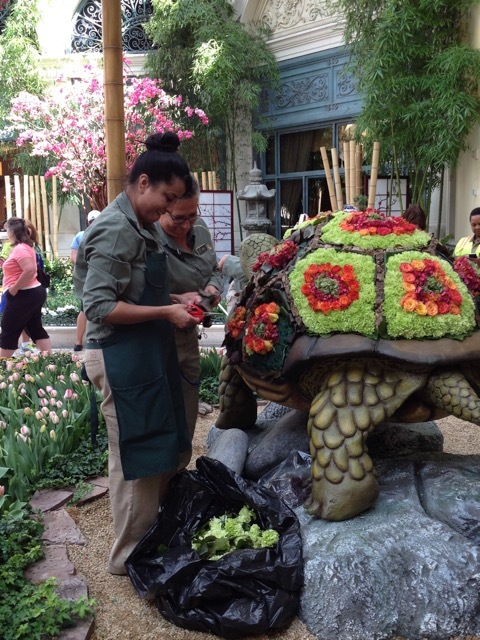 We also saw workers refreshing the flowers on the turtle's shell. This is a job that I would enjoy. How about you? While this is not 100% true for my generation, it certainly is for Marilyn's grandchildren who are in their 20s. I was a yearbook (annual) advisor for 25 years and clearly remember when digital cameras seriously came into play for snapping yearbook photos. Pixel count was a BIG deal for those early cameras and anything less than 10 pixels simply did not take photos worth publishing in the yearbook. In those days, the staff relied on Pentax SLR cameras, and they were workhorses and took a LOT of abuse from the student photographers. I taught the students how to develop their film in the darkroom and print their own photos, too. I loved watching their excitement as the images seemed to pop off of the paper as it was in the developer tray. 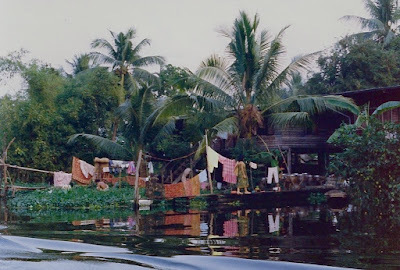 Gradually, those days disappeared as digital cameras improved, and the darkroom was used less and less. By the time I retired, it was rarely used for anything but storage. I love digital cameras, but I think film cameras still have a place in our modern world. Very few people actually print photos anymore. I fear that future generations will not know the joy of opening a box filled with old photographs and reading the names written on the back in a steady or wobbly script. How many digital images have that information? What are you doing to organize and identify the people in your digital images for future generations? If you've read Wyoming Breezes for a length of time, you know how much I enjoy taking photos, especially of old buildings. I take the photos for two reasons: I like the architecture, and I want to preserve a bit of history. My nephew, Bruce drove my sister, two brothers-in-law, and me to the casino in Mahnomen, MN one day in late February. One the way there, we passed this delightful old elevator, and I told Bruce I'd like to get a photo on the way home. I was delighted that he remembered and pulled over to the side of the road. The building is well-maintained and should see more years of useful life. 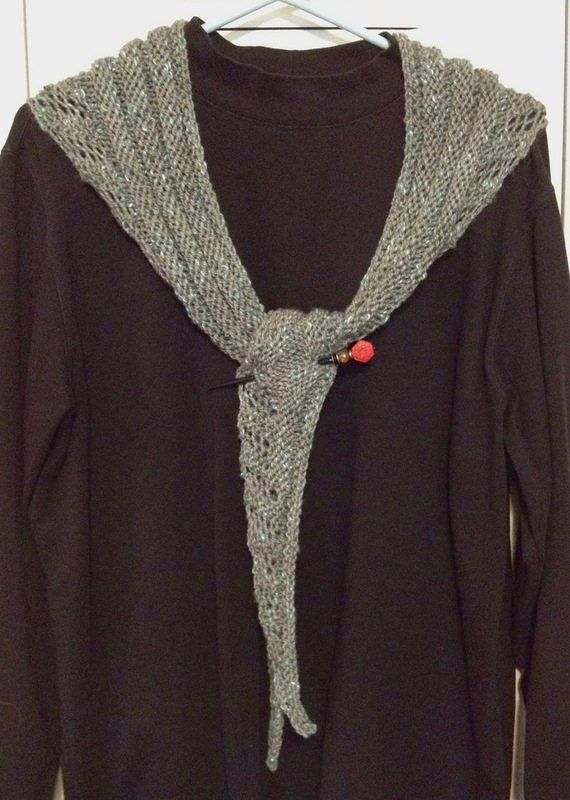 After finishing the Sakura scarf, I decided to knit another Hitchhiker scarf but with eyelet lace every repeat. On the eighth row of the pattern, I bound off as the pattern requires, and then K2tog, YO until the last two stitches, K1, Kfb. Since there is more yardage in this skein, the scarf will undoubtedly be longer than the Sakura scarf. 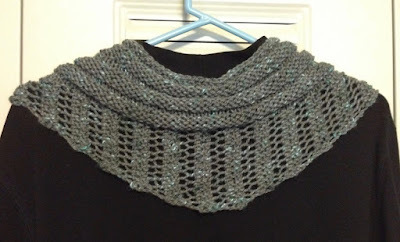 During Show and Tell at the March Fiber Guild meeting, I saw Jeni V's finished Gallatin Scarf and knew that I had to knit the pattern. 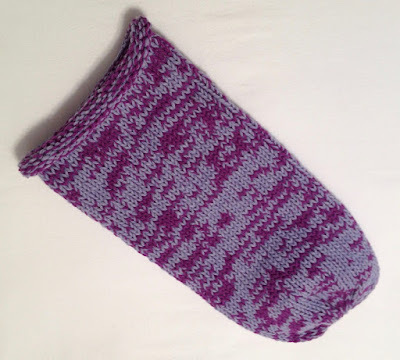 The pattern is free on Ravelry and it is a fun knit. 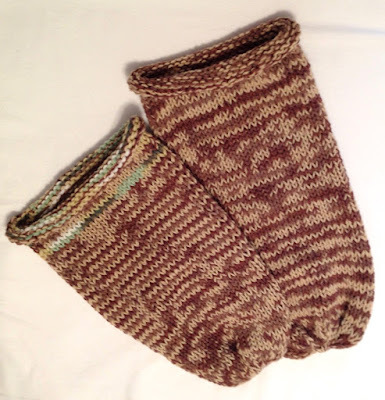 Note: the pattern calls for worsted weight yarn. The Echo Twist was a very light worsted almost sport, so my scarf is not quite as large as the ones on the Ravelry site. The top photo represents the true color of the yarn. All of the worsted yarn that Ellen sent has been knit, and resulted in four cuddle sacks. Note the bit of green at the top of the smaller cuddle sack in the photo. That yarn was remaining from the green ones I finished earlier and posted about here. Last Monday, I accompanied my friend Sue to a charity knitting group that meets at the Extension Office on the second and fourth Monday of each month. They have yarn available for those who attend, and since I was between projects, I selected two skeins and got to work on another cuddle sack. 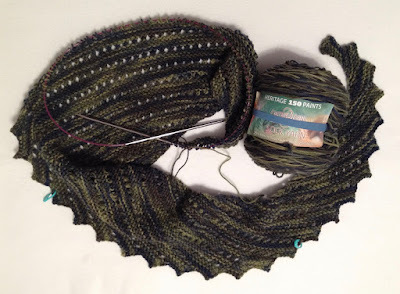 It came off the needles on Friday. The five cuddle sacks will be laundered and then taken to the local pregnancy center. 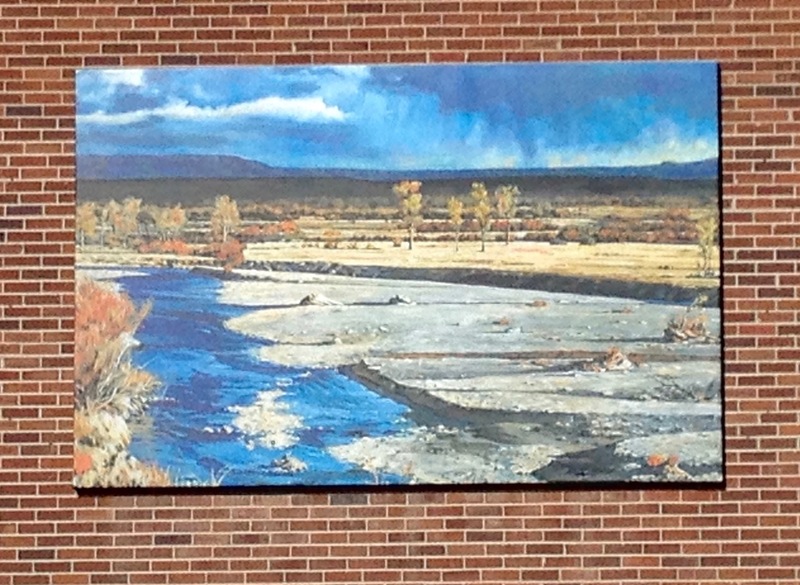 I can't remember when this large mural was mounted on the wall facing the post office, but it has been quite a while. Last week, I went to the post office early to mail a Quilt of Valor, and the street was void of vehicles, so I snapped a couple of photos. 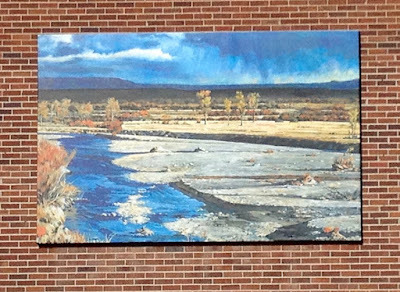 Another "new" mural (it's been in place for over two years) is on the A.D. Martin storage building, but I have yet to take a photo because it's in an awkward position on Main Street. I've avoided getting a photo because of its position and the traffic. Maybe someday the time will be right. 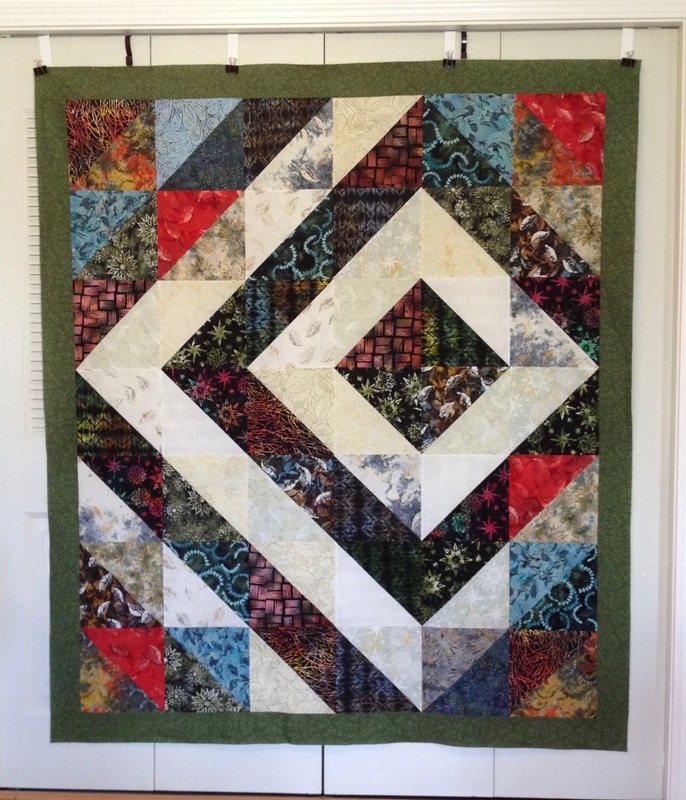 The majority of this quilt top was made from a single, Tonga Treats (City Lights) layer cake* that I purchased in a Craftsy clearance sale for $21. 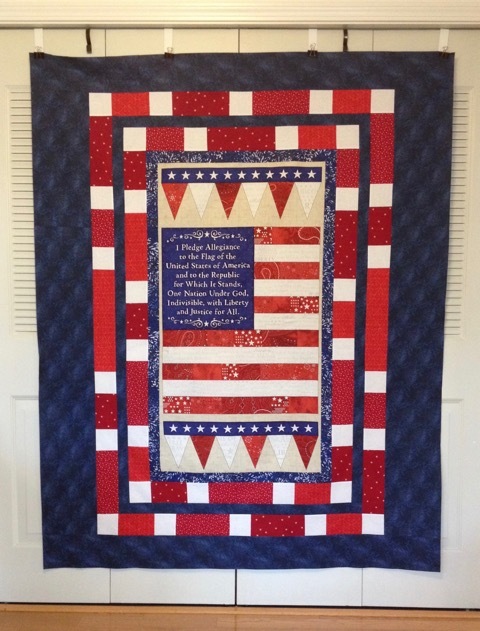 I added a 3.5 inch border to bring the quilt up to Quilt of Valor (QOV) size requirements. Thanks to the Craftsy sale, this quilt was made for less than $25. Of all the QOV I've made, this one is in my top ten favorites. Diamond Facets is #89 on my completed QOV list. * a layer cake = (40) 10 inch squares of fabric from a fabric line. 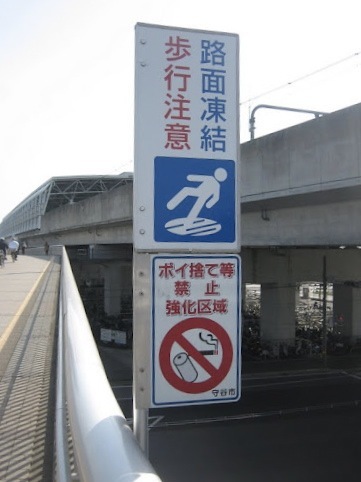 Today's photos are provided by my friend, Sheila N. She snapped these photos at a train station when she and her husband, Doug visited Japan in 2012. Other trip photos that Sheila shared can be seen here. 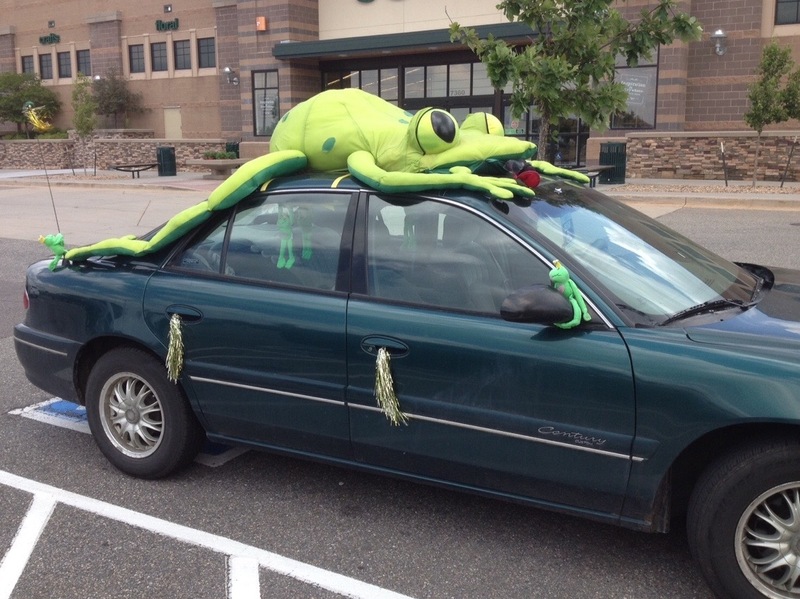 Last year, Marilyn and I spotted this unusual car in the JoAnn's parking lot near Denver. 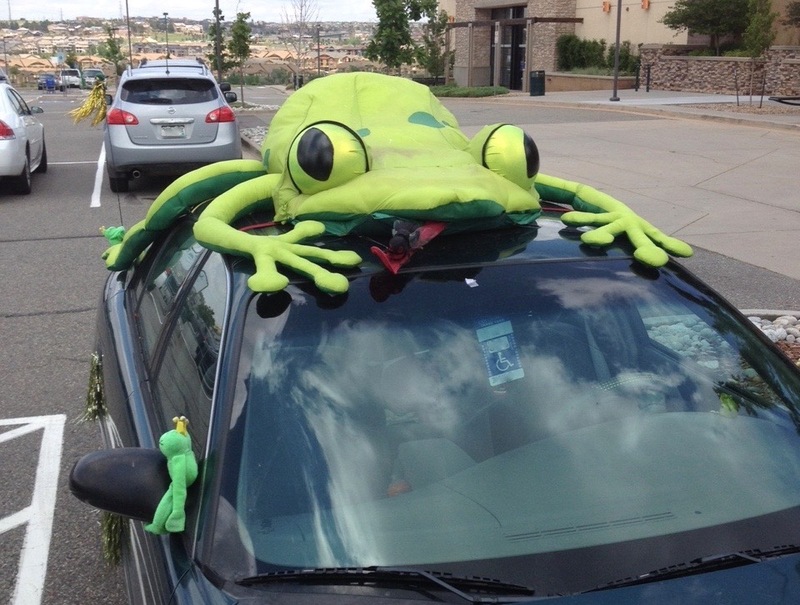 Obviously, the owner loves frogs, as you will notice they are on the windows, aerial, and mirrors, too. As unique as this frog car was, I can honestly say it is not the most unusual vehicle I've ever encountered. That distinction would have to be reserved for this pickup, spotted near the Redrocks on the way to Dubois, WY in 2010. 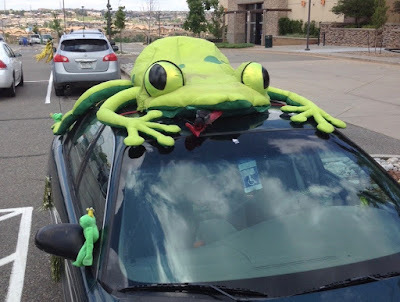 What's the most unusual vehicle you've seen in your travels? My great-niece, Stephanie will be finishing her studies as a Dental Assistant and graduating in three weeks, and I'm very proud of her. Stephanie is currently working for a dentist in Nebraska but recently had an opportunity to go on a week-long dental mission to the Dominican Republic. She jumped at the chance, and I'm glad she did: the experience she gained and opportunity to help others will be something she will never forget. Here's what Stephanie had to say about the mission, "It was an amazing experience that I will never forget. Met some really nice people, I would like to go back sometime soon." Congratulations, Steph! Your future will be filled with many opportunities, and you will help many people in your chosen profession. The Henry Glass and Company center panel (American Dreams) with the flag and pennants was purchased in a Manhattan, Kansas quilt shop last summer, but I haven't seen the panel in any other quilt shops. 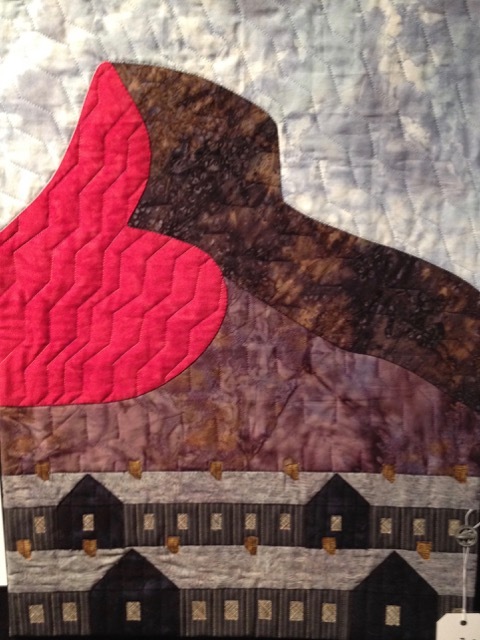 I used a variety of red and blue fabrics from my stash for the five borders. Recently, I joined three friends at the Crux in Lander for some tea and a light breakfast. While we chatted, the young man pictured above provided delightful music on three different stringed instruments. 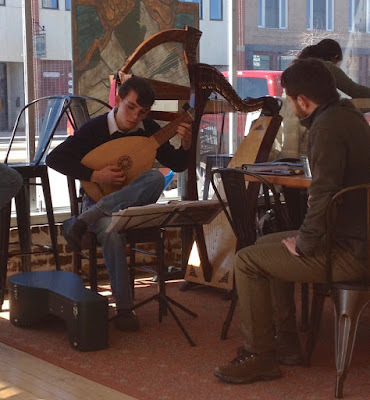 If you look closely, all three can be seen in the photo: large harp (to Julian's left), small Celtic harp (shown horizontally above Julian's head), and the lute Julian is playing. 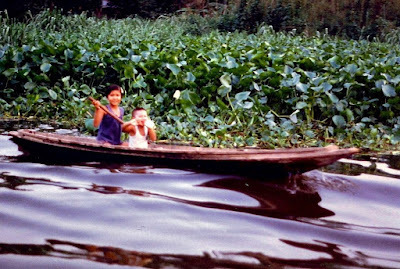 I loved gently gliding down the river and snapping photos of the surroundings. As you can see the water was smooth and slow moving. The river was so calm that it wasn't unusual to find children maneuvering boats to go on errands or to just have some fun. The yarn I received from Ellen a couple of weeks ago, prompted me to knit some baby cuddle sacks. I added a small ball of off-white scrap yarn to knit the second one. - visible in the top left. I've already started another sack with the brown yarn. 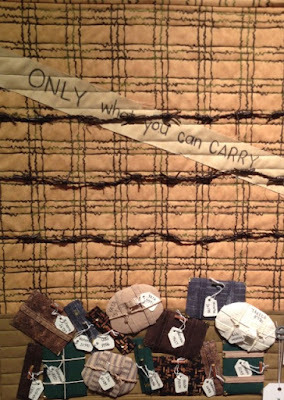 In 2009, I made several cuddle sacks with scraps. Thank you, Ellen for making these cuddle sacks possible. They will be donated to a local pregnancy center. Recently, I went to the Heart Mountain Interpretive Center with some friends. 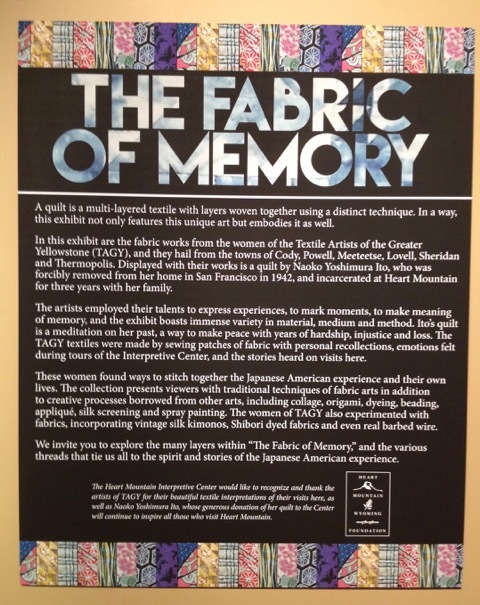 I had been to the museum before, but I really wanted to see the featured quilt show, entitled The Fabric of Memory. The photo above gives an explanation about the show and those involved. 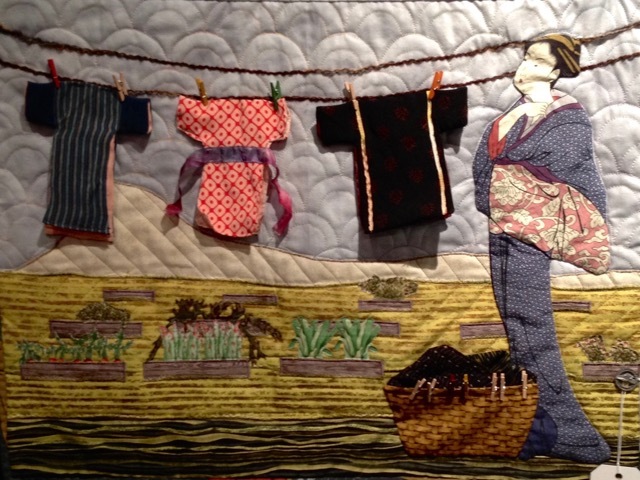 Below is a sampling of the small, art quilts in the exhibit. The tag for Daily Chores stated, "My inspiration for this piece is the human spirit and how we can make the best of any situation. As detainees adjusted to their new life at Heart Mountain, they continued their daily chores, including wash day and gardening. They built raised containers for vegetable on the hillside and raised crops on the flats. These farming techniques were so successful that their crops supplied other relocation camps with fresh food, as well. 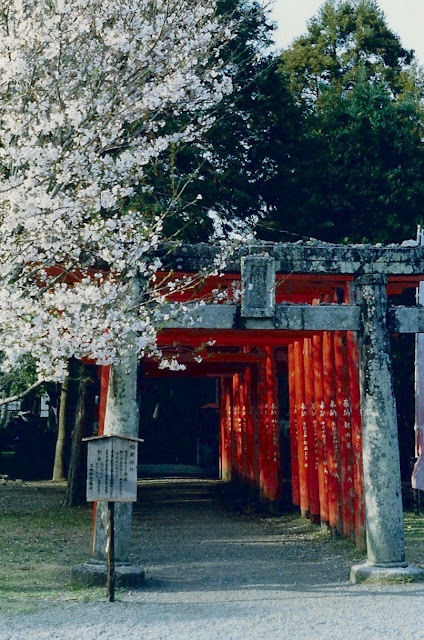 The clothes drying in the breeze are made from actual Japanese kimono scraps." On the tag: "Trapped in old Wyoming barbed wire are origami fabric cranes, representing the Americans of Japanese descent illegally imprisoned at Heart Mountain Internment Center. One of the reasons this project resonates with me is my personal experience with unfair childhood incarceration. As an 8-year old foster child, I was incarcerated behind barbed wire at a juvenile detention facility in Oregon." On the tag: "Over 127,000 Japanese Americans were imprisoned during World War II under Executive Order 9066. Half of these U.S. citizens were children. It is heartbreaking to imagine how 'Mother' and 'Father' felt not knowing where they would be sent, what the conditions would be, would the children stay with them or be separated. I imagine there was a lot of worry and concern for all of the family. Many of the photos at Heart Mountain Interpretive Center are of the children. Although the circumstances were extremely hard for anyone imprisoned illegally, I found that in many of the photos the children were playing baseball, marbles, running and doing schoolwork. I wanted to show that side of the camp in my art. The children of these camps are now grown. Many have had very successful lives. And that, reminds me of a quote: 'Hardships often prepare ordinary people for extraordinary destiny.' 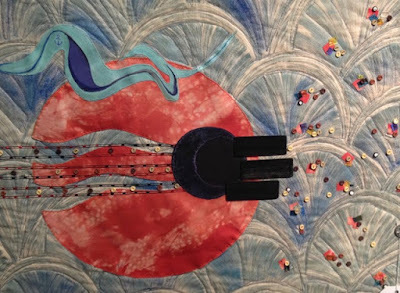 CS Lewis"
"Let It Not Happen Again"
On the tag: "My quilt is a timeline: The 1941 bombing of Pearl Harbor is the oil spill at the top of the quilt. (2-9 qts/day still seep from the wreckage of the USS Arizona.) 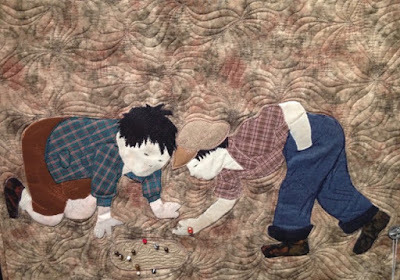 The subsequent 1942 internment of Japanese Americans is represented by buttons (people) being railroaded through an angry and confused orange world and into a dark hole/barracks. The freeing of Japanese Americans from Heart Mountain Internment Camp in 1946 is represented by the scattering of buttons and celebratory yarn. They are going home. The U.S. apologized to these Japanese Americans in 1988. Wisdom (finally)! I created this quilt with Shibori dyed fabric, photo art and acrylic paint on fabric, yarn and buttons." On the tag: "Heart Mountain is a landmark that has witnessed both geologic and human events. May its name remind us that only love endures." On the tag: "In 1942 Franklin D. Roosevelt signed Executive Order 9066, which resulted in 'exclusion zones' where U.S. citizens of Japanese ancestry were to be removed. 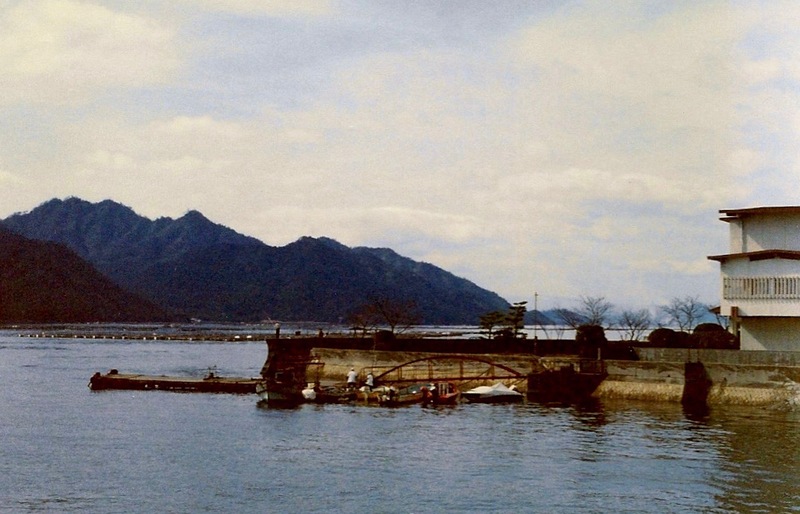 This ultimately led to the incarceration of 110,000 Japanese American citizens. 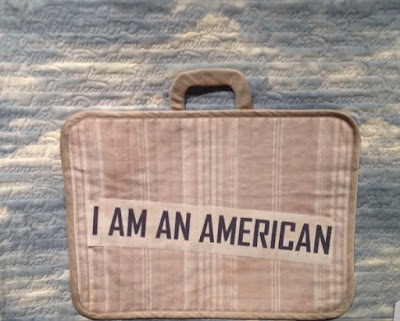 These American citizens with Japanese ancestry were allowed to fill ONE SUITCASE when they were taken from their homes, their jobs, their possessions and their business and brought to an unknown place with meager accommodations." 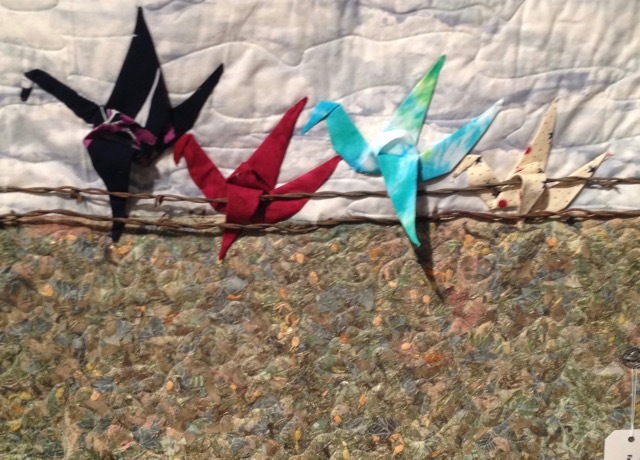 Note: the quilting on the blue background states, Executive Order 9066. 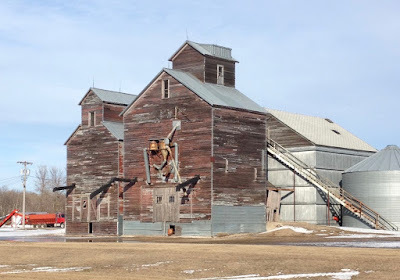 On the tag: "Each time I've visited Heart Mountain Interpretive Center the piles of luggage in various locations of the museum have remained in my thoughts. 'Only what you can carry' echoes in my mind as I consider the limited time the internees had to make important decisions with very little information about the future. They had no idea of what lay ahead. I wonder what they chose to pack without knowing where they were going or how long they would be away from home. Each person was given a tag listing their family name and number. In addition to these, I've added their barrack assignment on the back of each tag on my art quilt. I think about what I would take. Keepsakes? Extra clothing? Important documents? 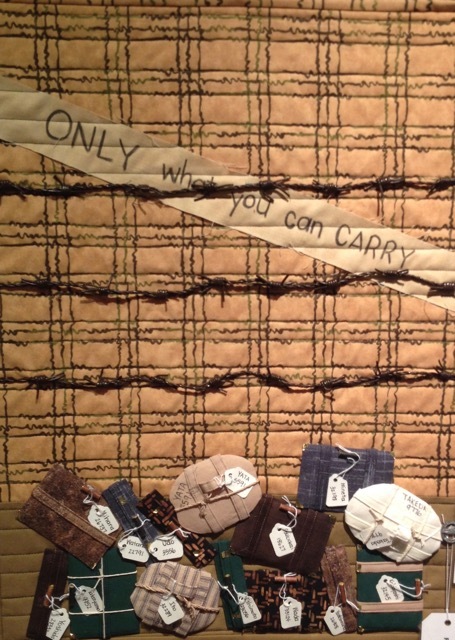 What would you choose to carry in your bag if you had to leave home for an undetermined place and time?" The exhibit was impressive, and the pieces in this post are only a fraction of those on display. 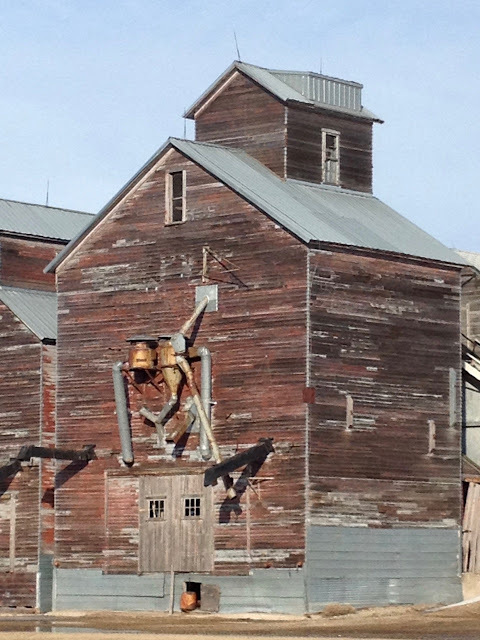 An earlier post about the Heart Mountain Interpretive Center can be seen here.